Rescue workers in the Taiwanese city of Hualien scrambled to search for survivors in buildings left tilting precariously on their foundations Wednesday, after an overnight earthquake killed two and injured more than 200. Authorities said they could not verify how many residents were still missing after the 6.4-magnitude quake which hit the popular tourist city late Tuesday. Rescue efforts were focused early Wednesday on the Yun Tsui residential building, which also housed a restaurant, shops and a hostel. The quake left the 12-storey building leaning to one side, its lower floors pancaked. The Hualien local fire service said 147 of the 213 residents from the building remained unaccounted for. "I saw the first floor sink into the ground. Then it sunk and tilted further and the fourth floor became the first floor," said Lu Chih-son, 35, who saw 20 people rescued from the building. "My family were unhurt, but a neighbour was injured in their head and is bleeding. We dare not go back home now. There are many aftershocks and we are worried the house is damaged," he told AFP. President Tsai Ing-wen visited the site Wednesday morning, where officials were going room by room looking for anyone trapped inside. "Now is the prime time for our rescue efforts, our first priority is to save people," she said in a Facebook post. Liu Yan-hu, from the Hualien County Architects Association, told Apple Daily it looked like the building's main structure was intact. Hualien is one of Taiwan's most popular tourist hubs as it lies on the picturesque east coast rail line and near to the popular Taroko Gorge. Frequent aftershocks left some residents stranded in the open as they feared going back into buildings. Authorities said 830 people were in shelters Wednesday morning and some 1,900 houses were without power. "The lower floors sunk into the ground and I saw panicked tourists being rescued from the hotel," eyewitness Blue Hsu told AFP. 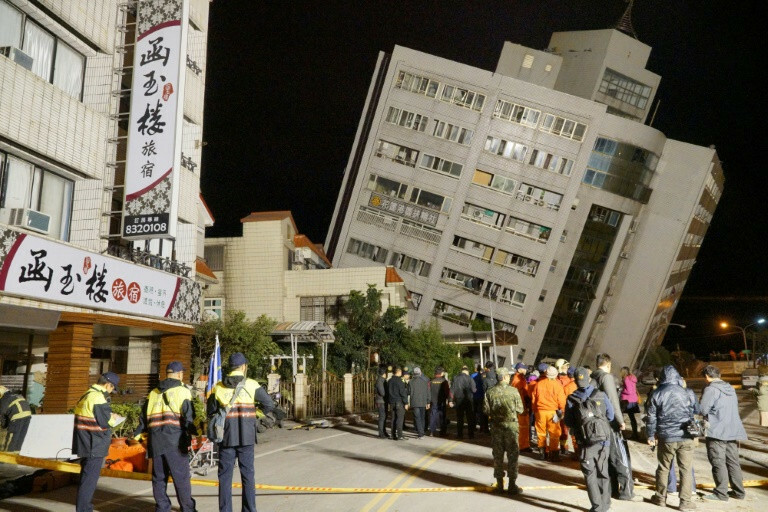 0 Response to "Rescuers scour toppled buildings after Taiwan quake"